A thanksgiving service is being held in York today for soldiers from the 1st Battalion of the Yorkshire Regiment who have just returned from a tour in Afghanistan. Following the service they will march through the city, with a salute being taken at the Mansion House. 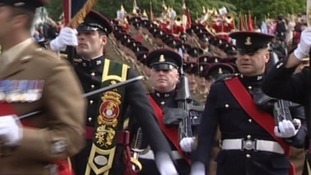 Soldiers from the first Battalion the Yorkshire Regiment have taken to the streets of West Yorkshire for a home coming parade. The regiment, who marched through Bradford this morning, have just returned from a six month tour in Afghanistan. This afternoon they marched through Leeds starting at Millennium Square, heading through Briggate before returning to the civic hall. The council then thanked the troops for their efforts on behalf of the country. 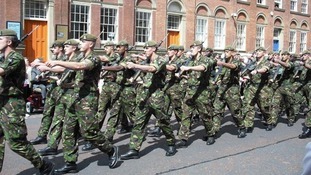 To mark the 1st Battalion of the Yorkshire Regiment returning from Afghanistan parades are being held in Bradford & Leeds. 120 soldiers from the 1st Battalion, the Yorkshire Regiment will mark their homecoming from operations in Afghanistan with parades through Beverley and Bridlington - towns in which they hold the Freedom to march with bands playing, bayonets fixed and colours flying. South Cliff Road to the dais near the Spa building. An inspection and presentation the parade will march off via South Marine Drive.